You can put every kind of fruit you like but to me, the main fruit is avocado. Different from how Western people use avocado, Vietnamese people don’t use avocado as vegetables (for salad for example) but as fruit. At home, or a simple dessert, we put avocado flesh in a bowl or a big glass, use sugar as much (or little) as you like and smashing the avocado with sugar using a spoon. Let it cool in the fridge while you are having a dinner and eat it afterward. In Hanoi, on the corner of Hang Gai and To Tich streets, it is sold at night (after 8p.m). Going around the old quarter, especially when it is autumn and to have this was nice, when I was a student. The smoothies were not sold cheap like other street food. I guess because strawberry was kind of expensive and it was for the effort of cutting different kinds of fruits. They always asked if you like to smash the fruits yourself or to have them smashed well using a blender. If you do it yourself, you can also try both. But I personally prefer using a spoon to smash the fruits since the texture of different fruits remains. I like the fact that they are not all well blended with each other since I can still feel the ‘real’ fruits. Anyway, try smashing smoothie once. It’s natural! Basically, the tropical fruits which you can smash (that’s why I’ve never seen longan, rambutan, grapes used for this). Strawberry is nice to use (but optional) thanks to its light aroma and flavor. The street version in Vietnam often has soursop, especially in the south. I didn’t have it here since I rarely see it sold in the Netherlands. But it’s really good, if you can buy a ripe one. (I was very surprise to know from my Brazillian colleague that there is soursop in Brazil and that he liked it too). Cut everything into small pieces. Use one tablespoon of condensed milk (more or less depends on how sweet your teeth are). Smashing them well. Good to serve when cool. 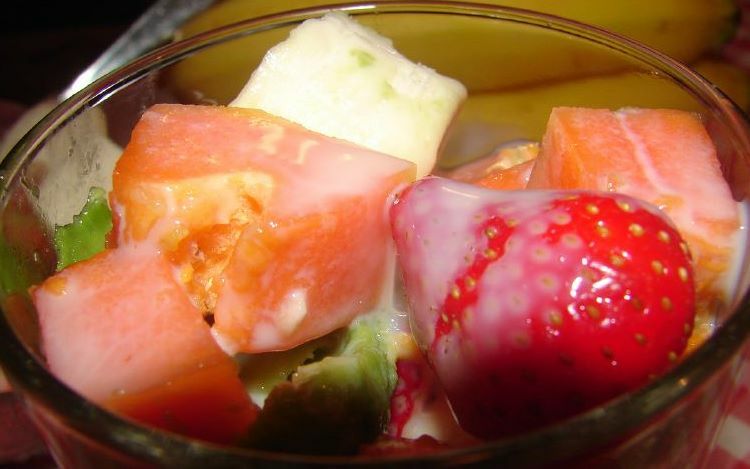 (Another name that is used in the North is Hoa Qua Dam, meaning Smashing fruits only). I’ve just found it mentioned in the list of 40 delicious thing in Vietnam. The author mentions the place to eat it at To Tich, the same place I think of whenever making and treating me this). 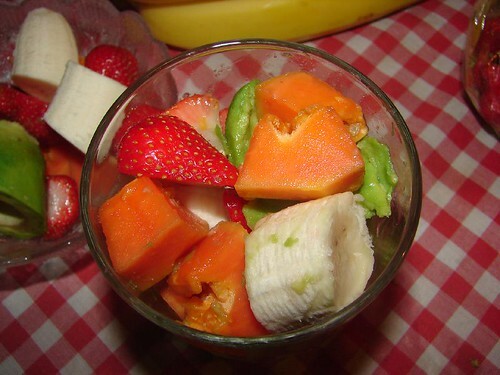 This entry was posted in Desserts/ Sweets, Vietnamese and tagged avocado, condensed milk, papaya, strawberry by QA-no9blue. Bookmark the permalink.